No, Tifosi — not in every clothing item with a prancing horse on it that you can find. F1 weekend is more fun in an actual horse head mask. I often go to races in a glorious blue velvet sombrero, but even that was quickly upstaged by the Horsemen of Formula 1 crew. The great thing about a Texas race is that there are plenty of gratuitous cowboy-themed decorations to ride like a horse. There are also giant sausages. You know, because race-sausage. Something like that. These guys have taken photobombing to a level that Fluffy Bunny can only dream of achieving. You can lead a horse to water, but...ewwww. Don't drink that, horse. Support races are always a highlight of the weekend. The chrome lilac Ferrari Challenge car that was near the front of the pack had the most fabulous racecar livery ever. At some point in my life, I need to own a chrome lilac racecar. Big nostrils make for plenty of lulz. Another awesome thing about F1 weekend is that they often have fun things on display, like this World Challenge Mercedes SLS. Our seats at Turn 12 were pretty good, too. "No, no, the view-hole is the mouth." 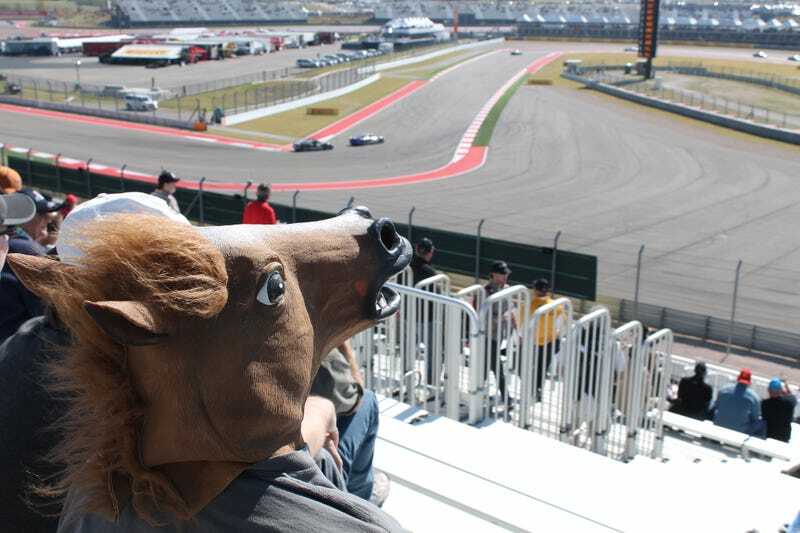 Formula 1 may be done for this year, but next year—bring a horse mask.